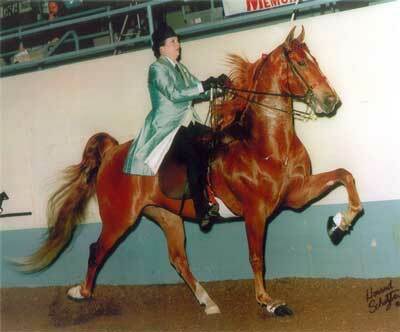 We purchased Nichols in 1992 and decided to show him in 5 gaited pleasure which showcases manners as well as ability. Our biggest hurdles were to teach him to walk, back and center, not gallop. Nichols loves speed, has a great heart and wants to please his rider. We showed successfully through 1995 with wins and reserves in TASHA, State Fair of Texas, Big D, Germantown, Big Easy and San Antonio. Nicholas is the 1995 AHSA Region Horse of the Year for region 6/7 5 Gaited Show Pleasure and even more impressive, the 1995 AHSA National Horse of the year 5 Gaited Show Pleasure Championship – 5th place. He has taught everyone in his life that peppermints will do wonders for him, his vets, farrier and friends. While Sir Nichols has been foundered for several years he is currently in rehabilitation.